Our team always try to find ways to support our chosen charities and meet their needs, whether they are material or financial. This all becomes possible with our partners and the involvement of all our offices, colleagues and friends. Early this year, we managed to ship toys and clothes for the children at Refilwe Community Project on a donation basis thanks to the help of our shipping coordinators and some of Hobart services providers who donated their time and efforts. 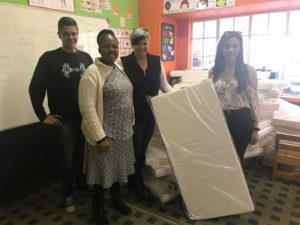 More recently, Ronell arranged for baby mattresses to be donated to the Preschool to provide some comfort to the kids for nap time. A projector was also donated by the HECT on this occasion. 24/09/17 – Women’s Mini Marathon Cork 4 miler – Registrations through HECT will cover cost of entries, participation for Refilwe and a lipstick for the guys who wish to take part! Date TBC – Cycleathon Outside Keary’s Mallow to get the legs moving before the race! The 947 South African team is currently organizing a Charity dinner to be held at Cnr Café Restaurant and Bar on the evening of Thursday 16th November. This dinner will welcome the final donations from all before the race which will take place the following Sunday 19th November. Details will be given closer to the date.